Bauerfeind MyoTrain Thigh Support from HealthyKin.com is similar to a muscle taping bandage, but is faster, easier and provides improved results. Directly after injury the additional acute pad can provide targeted compression to the injured area, to limit the consequences of the injury and shorten healing time. MyoTrain controls muscle tone and helps prevent repeated injury. It does not loosen with wear and pressure can be individually adjusted. MyoTrain does not slip, is washable, and can be re-used repeatedly. MyoTrain offers innovative support for everyday or athletic use in the treatment of thigh injuries. It is a high-quality medical product that can be easily put on and removed.MyoTrain works according to the principles of so-called muscle suspension bands (taping) using compression after muscle injuries and represents an effective therapeutic aid. 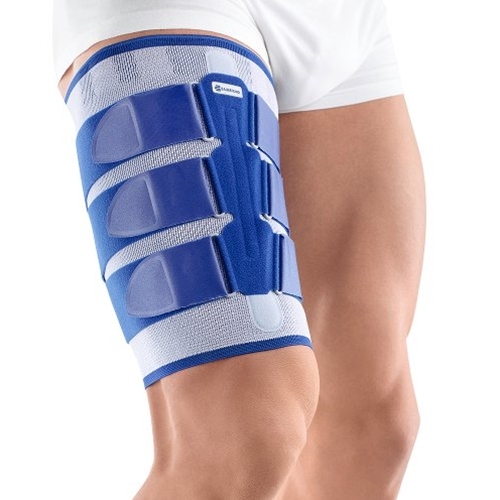 The combination of anatomical, breathable knit, two adjustable compression pads – acute and functional pads – and individually adjustable straps provide the highest level of treatment and comfort. Immediately following injury both compression pads are inserted into the support, to add targeted compression and to relieve injured muscles. The strap system provides individualized compression. The spread of the hematoma is minimized, and the extent of injury is limited and promotes the healing process. At a later stage, the MyoTrain can be worn without the compression pads.